I was so excited when I got my advanced proof of this book in the mail, courtesy of a goodreads firstreads giveaway, I took a picture of it and posted it on Facebook. Unfortunately my excitement didn't last long after I started reading it. I admit that it took me somewhere between 150 and 200 pages to finally realize I was approaching the book all wrong. I'm in the middle of Orson Scott Card's Ender's Saga, and this is a very different type of science fiction. Basically it's like Dirk Gently on Mars, but not as clever as a Douglas Adams book. I've read quite a few of Sawyer's novels, and he has a very simple writing style in terms of sentence structure and--necessary science jargon notwithstanding--vocabulary. His characters are equally uncomplicated, which is a mild way of saying they often feel to me like hollow stereotypes. What saves Sawyer's stories for me has always been his speculative ideas: what if everybody in the world simultaneously experienced a few minutes of their own future (Flashforward)? What if the Internet became sentient (WWW trilogy)? What if we could visit a parallel universe where Neanderthals survived instead of Homo Sapiens (Neanderthal Parallax)? The speculative idea in this book was: what if the discovery of fossils on Mars led to a gold-rush-type scenario? In comparison, this idea just didn't cut the mustard with me. Sure, people could also transfer their consciousnesses into android bodies, but that's a pretty well-used idea. Sawyer probably knows this, so he didn't really bother exploring the implications of it here. Instead we get a story about a bumbling private detective who gets mixed up in the lives of people trying to find a long-sought-after fossil deposit. I don't read P.I. novels, so I really don't know how Alex Lomax stacks up as a main character in that genre. He thinks he's a wit, even though his jokes consist mainly of cheesy-dad puns lame enough to make a seven-year-old roll his eyes. He kind of just fumbles around, sleeping with hot women and getting other people killed. Maybe that's a "gumshoe" genre convention too, I don't know. The plot is actually a series of three plots in the sense that the story seems to be wrapping up twice before it actually does. The first time this happens is due to the fact that the first ten chapters of this book were originally a novella called Identity Theft. The second one happens when the main plot seems to have climaxed, but there is actually more to come. To be perfectly honest, I found this book to be a series of silly antics and repetitive gunpoint stand-offs that had difficulty keeping my attention. Aside from Rory--who was endearing despite being somewhat of a stereotype--I really didn't care about the characters and what happened to them. 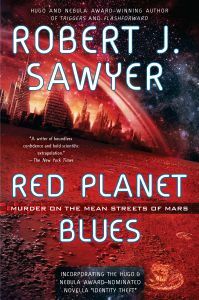 If you read purely for entertainment purposes and enjoy non-serious private detective novels, you might enjoy Red Planet Blues. I like to read books that make me think a little, and this one just didn't. So for me, it was disappointing.